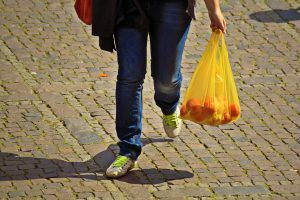 Plastic bag recycling may seem like a small thing, but plastic bags are a huge threat to the environment. Did you know that a plastic shopping bag can take anywhere from 15 to 1,000 years to decompose. Plastic bags don’t biodegrade, but are at risk for photo degradation, as sunlight exposure dissolves them into toxic polymer particles. Most often, when this happens, it happens in the ocean. recycled worldwide; the rest are left to live on indefinitely in landfills (or worse, in the environment). The United States alone uses approximately 100 billion new plastic bags per year. Plastic bags make up over 10% of washed-up debris polluting the US coastline. Made from petroleum products and natural gas, plastic bags utilize nonrenewable resources, ultimately helping to drive up fuel prices. It takes 12 million barrels of oil to produce the amount of plastic bags the US uses per year. Over a lifetime, use of reusable bags by just one person will save over 22,000 plastic bags. Plastic bag recycling is an easy way to make a positive impact on our environment. Action Shred of Texas is a family owned and operated business that has provided secure, environmentally friendly shredding service in Dallas and Fort Worth since 2003. As a homegrown business, we’re committed to protecting the environment for ourselves and future generations. That’s why we recycle everything we shred.